Be prepared for a long relaxed weekend of peace, liberty, and family friendly camping this summer! This event started as a group of Liberty minded friends who wanted to connect together over a weekend camping trip. In just seven years, it has grown into the major liberty event in this area. Welcome to the party! The 7th annual Midwest Peace and Liberty Fest will be held Thursday June 20th through Monday June 24th, 2019 at the Circle Pine Center in Delton Michigan. Circle Pines is located at 8650 Mullen Road, Delton, Michigan 49046 (see map). Check out the area map showing the camping areas, cabins, and Pavilion. Follow us on Facebook for updates about the Fest. Please bring your own food to the Fest. Some people may be selling or giving away food, but we cannot guarantee there will be enough to meet your needs. Registration for MPLF VII is Open! Registration for MPLF VII is now open! We are accepting credit and debit cards or you can pay with Bitcoin. Register today and take advantage of the early bird pricing (before 5/1/2019). Check out the Prices page for more information and available options. Registration for the Fest is now closed. Please pay with cash (FRNs) at the check-in tent when you arrive. (See the area map.) Due to issues with connectivity, we won't be accepting Bitcoin. 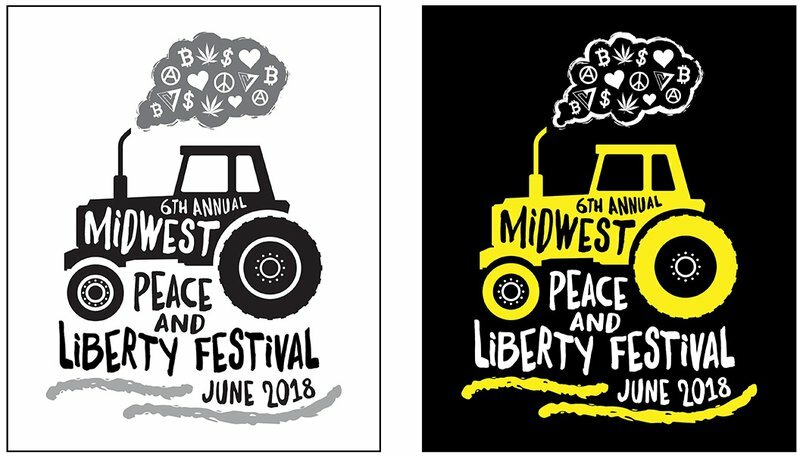 Would you like a 2018 MPLF T-shirt? Look for Gretchen Clark, who will be selling these at the Fest.